The Geek Culture Forums! : ha ha love it... "Atheists"
Author Topic: ha ha love it... "Atheists"
There is a fairly simple answer to this. If God grants us free will, then the possibility of evildoing is part of the package. I suspect however that the translation is inaccurate, as there is a much more difficult philosophical problem for anyone with religious faith if you substitute the word "suffering" for "evil" in this quote. Why does a benevolent God allow suffering? There is suffering that is a direct or indirect result of the exercise of human free will, whether such suffering is intended, or accidental, whether foreseeable or not. But there is also suffering caused by cataclysmic natural events, for example the recent tsunami, for which there is no human cause. Or to take an example that is more immediate to myself, why did God give my wife MS? This problem has exercised religious thinkers from the beginning, indeed the whole of the Book of Job in the Old Testament is an extended meditation on this, but there are no satisfactory complete answers to this, and those with faith have to accept that this is one of those instances where "God moves in a mysterious way". I expect Garlic and Rhonnie can flesh out these arguments with rather more sophistication, but I feel this is the most convincing of all the arguments against religious faith. If God grants free will (as your average Judeo-Christian religion says), then part of that package is the granting of the freedom not to believe in God. Therefore, no arguments against religious faith should be necessary. Something else that always interested me: the God in the Bible never seemed to concerned about what, say, Egyptians and Romans were worshipping and believing. He pretty much seemed to be bossing around the Israelites. Last time I looked, I wasn't an Israelite. I'm not sure you could find an Israelite in my family tree, even. (Maybe, you never know, but there'd be other gods that would have a much stronger claim.) God got really mad too, if I remember correctly, about his Israelites worshipping other gods. That doesn't really say "one and only" to me. That says "I don't want to share my followers," especially since he went and gave them free will. So it always seemed to me that God believed in other Gods, even if he didn't want the Isrealites to. Also, Callipygous, I am very sorry to hear about your wife. It's kinda like pickin' yer nose, dman. It might take a few trys, but you just know when you get it right. So it always seemed to me that God believed in other Gods, even if he didn't want the Isrealites to. Quite right, there's evidence that the early Hebrews were not monotheists, until the cult of Yahweh got the upper hand and suppressed the other cults. Ahem... This will be my only post on this topic since I believe that religion is no more than a mental exercise gone wrong. That's the Father, the Son and the holy toast, right? Before the single God of the Bible, there was a divine couple, and Asherah was in effect, God's wife. ... the cult of Yahweh got the upper hand and suppressed the other cults. Hey TFD, try not being a hypocrite ... refer to Islam as the "cult of Mohammed." 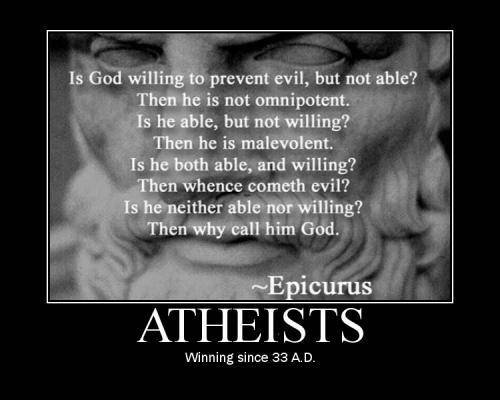 Atheists -- Winning since 33 A.D. It doesn't make since to say "since 33 A.D."
First, Epicurus lived from 341 BC to 270 BC -- shouldn't it be "since 270 BC"? Second, how is it winning if a new religion pops up, then gains more and more followers? Wouldn't that be "winning from 270 BC to 32 AD"? Then there's the "Mideast" ... How do they spin that one? "Atheism -- Utterly crushed in Afghanistan, Iran, Iraq, and Saudi Arabia ... but we have the MORAL Victory!" (IMO) Unless one uses agnostic (atheist) perspectives, one's observations and conclusions on various religions have little or no legitimate value. God in the Bible never seemed to concerned about what, say, Egyptians and Romans were worshipping and believing. He pretty much seemed to be bossing around the Israelites. However, it looks like your observation about only "bossing around the Israelites" still works, so Christians follow the Israelite god without having to get "bossed around." You read that in, ASM. But you do that a lot so I'm not surprised. Definitions of cult. Given that Allah is Arabic for Yahweh and Muslims worship Allah, I'd say Islam, like modern Judaism and Christianity, is also a cult of Yahweh. So very, very, very confused. Please ASM, entertain us some more, tell us all about how Mao Tse Tung led the 12 disciples across the Red Sea to Salt Lake City. For the record, I was using "The Cult of Yahweh" in the same way that I would use The Cult of Zeus, to refer to a specific sub-branch of a polytheist religion. Why does a benevolent God allow suffering? My pastor has spent the past two months on studying the book of James, and we're only in the second chapter, I believe. Incidentally, it coincided with some rough spots Jonathan and I were going through at the time. We weren't really suffering (as compared to other people), but it was a stressful time for us. Pastor Jamie's point, though, was that God allows things to happen to make us stronger. Suffering is not pleasant, but the experience strengthens our faith and dependence on God. Or else we can rebel and fight God and become bitter and hardened. Jonathan and I have definitely come out stronger as a result of our struggles. We've used those opportunities to grow our relationship with each other and with God. It hasn't been fun, but the results are priceless. Reading ASM's posts, I sometimes get the same feeling I get when corresponding with the Canada Revenue Agency - that the conversation they're having with me is almost completely unrelated to the conversation I'm having with them. It's simple. "Religious sect" has no negative connotations. When the media (or anyone else) wants to attach a negative stigma to a religious group, "cult" is (almost) always used. Even "cult of personality" is NOT a positive term, although it has nothing to do with religion. "Cult Classics" (movies) has nothing to do with religion, but implies "following" something incredibly "bad." From the link you provided, godweb.org was very clear about "cult" being a derogatory term. Mohammed was neither Jew nor Christian. How does one "split off" from a group that one never belonged to? ... almost completely unrelated to the conversation I'm having with them. By observation, "everyone" seems to believe "Atheist" means anti-Christian, but not critical of any other religion. To believe atheism "began winning" once Jesus was crucified, instead of when some of the most well-known philosophers criticized religion, totally ignores the philosophers themselves (Epicurus for example). If you only want to discuss "why does god allow suffering?," then I can cover that also. Ah - so it's not just my imagination, then? Technically, that should be "Cult of Allah." "Cult of Mohammed" would work if TFD had said "Cult of Moses." There is a difference between a deity and a prophet. Ok, I've tried, I really have, but I just can't take it any more. Muslims believe that the Jewish god is the same as their god and that Jesus is a divinely inspired prophet, but not God. Now do you understand what Xanthine means? I don't think you have been doing your homework ASM. Mummy will be cross. This is more or less what the book of Job says too. A contemporary secular way of expressing this is that "whatever doesn't kill you makes you stronger", but that is where it also falls down, as not everyone possesses that kind of courage, or we would not find those qualities so remarkable and admirable. For the rest of us there are not only scarring experiences that may leave you a wiser but a weaker person, but also others that may destroy the spirit in a person. For example it is hard for me to see what divine purpose might be fulfilled by the suffering caused by extreme cases of mental illness. I don't see this as an insuperable barrier to faith, but there is not a satisfactory answer either. I don't pretend to know all there is to know about scripture or what it means to be a christian. I purposefully try to daily live as one who follows the teachings of Christ even when it puts me at odds with others who also say they follow. I can say that I have no answer for you about suffering that will make a little light come on in your head and be the final word. The answer that has satisfied me is that suffering does do one good thing in that it teaches and gives opportunity for compassion. Whether we learn that lesson and take advantage of it is up to us. Islam is what is known as an Abrahamic religion, meaning that it shares much of the same heritage and origins as Judaism and Christianity. Not a single word of the Koran (Qur'an) comes from Christian or Jewish tradition. It can't if it all came via an "angel from god." The link between Christianity and Judaism is easily proven because the Old Testament of the Bible _IS_ Jewish tradition. Islam shares about as much heritage with Christianity as Buddhism shares a heritage with Christianity. The Romans say Jesus was crucified. The Jews say Jesus was crucified. The Christians say Jesus was crucified, rose from the grave, and through faith in him god offers salvation and eternal life. Islam says Jesus was never killed. People with above average intelligence, will probably say the Islamic view of this piece of history is radically different from the Christian, Jewish, and Roman views. The Lunatic: "Crucified," and "not crucified" are the same. The only difference is one's point of view. The Conspiracy Nut: It was all a conspiracy by the Ante-Conservatives where the Jews, Romans, and Christians faked the death of Jesus to wage war against Islam ... preemptively. How about the Ten Commandments? Why "reinvent the wheel"? The Christians kept the Ten Commandments -- which makes sense when you're worshipping the same god. Finally, if Christians and Jews insist that their faiths have little in common with Islam, especially in religious doctrine and practices, why believe the Muslims over them? WARNING: If I use Islamic theology as given by sources in Iran and Afghanistan to show contradictions against Jewish and Christian traditions as "Abrahamic religions" -- YOU WILL NOT LIKE IT (and you'll have a hard time proving they're not Muslims). Thank you ASM, now tell us how Paul Revere won the Civil War by taking elephants over the Alps.